Lymph node. 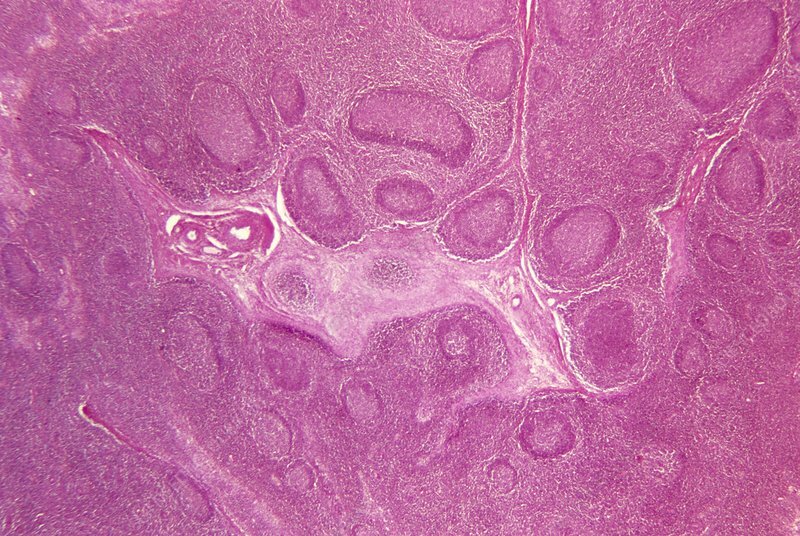 Light micrograph of a human lymph node. Lymph nodes are kidney-shaped organs packed with white blood cells that destroy disease- causing microorganisms within the body. Fluid from body tissues drains through lymphatic vessels into the nodes to be filtered. The granular appearance of the tissue is caused by thousands of lymphocyte white blood cells packed together. The rounded structures within the node are called lymphoid follicles. These contain germinal centres where B lymphocytes proliferate. The pink tissue in the centre is fibrous connective tissue that provides structural support. Magnification x4 at 35mm size. Magnification: x12 at 6x9cm size.